Tire skid marks show the path of a vehicle that crashed into Steve’s Market in DeGraff in the wee hours of Saturday morning, July 4. DEGRAFF – Two people were taken to area hospitals after a driver lost control of a vehicle and crashed into Steve’s Market, 300 Cretcher St. in DeGraff at about 3:47 a.m. July 4. 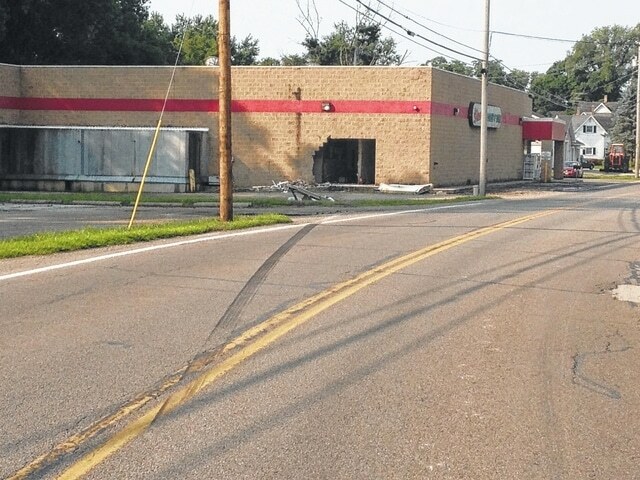 Preliminary reports from the Logan County Sheriff’s Department indicated that the vehicle was traveling southbound on state Route 235 (Cretcher Street) when the driver failed to negotiate a curve to the right and veered off the left side of the road, narrowly missing a utility pole before continuing and slamming into the north face of Steve’s Market. The passenger in the car was taken from the scene by MedFlight to OSU Hospital. The DeGraff Fire Department and Riverside EMS also responded and the driver was transported to Mary Rutan Hospital in Bellefontaine by Robinaugh EMS. As the accident remains under investigation, the names of the driver and passenger have not been released.